Erm… Is this actually supposed to be taken at face value as a “Women are evil harpies who only date hot guys in positions of power”? Is it making fun of that attitude? Is it something else entirely? It’s more a statement on the ‘sexual harassment laws are pretty girls defense against ugly people’ belief. That’s what I took from it anyways. If a girl thinks you’re attractive, you can get away with saying most anything to her, if you’re not, just looking vaguely in their direction earns you a good pepper spraying. god help you if you try to politely compliment them, if you’re ugly. Felt more like sexual harrasment opposite day. Then again, maybe I’ve just been reading too much about politically motivated prosecutorial misconduct and abuse of the judicial system by the wealthy here in the U.S., so perhaps I’m too easily led to a similar interpretation. I do agree with that one guy’s interpretation. or were just making fun of walmart and the whole orientation procces…. Like going back to kindergarten, but without the fun. Wait…. “Harassment so much to me” = he loved the booty. Also, first showing of exploding clothes! 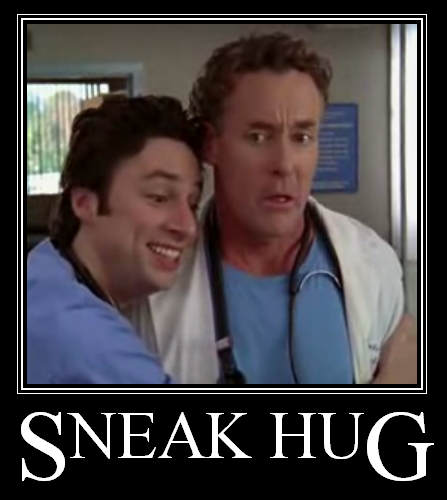 Sneak hug :) I like that. Thank you for the cool comic.